We know that students who miss too much school suffer academically at every age and every grade. Equally important, we know absenteeism is a problem we can solve if districts and schools identify the students most at risk and then work with parents and community partners to turn around attendance and achievement. 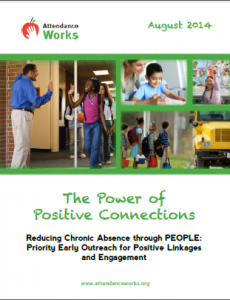 The Power of Positive Connections toolkit calls for using absenteeism records from past years and from the first month of school to connect the most at-risk students to personal relationships and positive supports that motivate them to show up to class every day. As students head back to school, the toolkit provides a step-by-step guide to a data-driven strategy known as PEOPLE — Priority Early Outreach through Positive Linkages and Engagement.